Want to convert RTF to PDF without any fuss? Here is the solution for you. Just read on to find out the best RTF to PDF converter to create PDF from RTF. The easiest way to convert documents in RTF (Rich Text Format) to PDF without losing the document formatting is to usePDFelement ProPDFelement Pro. This PDF tool is available for both Windows and Mac operating systems and can be used to convert PDF documents not just from RTF to PDF but from most of the popular formats to PDF easily and quickly. To use PDFelement Pro to convert RTF to PDF, all you have to do is open the RTF file in the program and it will be instantly converted. The resultant PDF document will be open in the program. You can then use one of the many tools on the program to edit the PDF document's text or images and save or share it when you're happy with the edits. Simply click the above download button to free download the program file for this RTF to PDF converter. Then you will get the installation wizard pop up automatically. Just follow the on-screen steps to set up the program. After that, run the program and go to the main interface as below image. Now click the "Create PDF" button in the main interface, and you will get a pop-up window to browse the RTF files in your local folder. Select the file you want and import it to the program. The RTF file will be opened with the program immediately. Then go to the "File" menu and click the "Save as" option. And you can specified a file name and destination for the created PDF file, and then click "Save" to start converting RTF to PDF format. Want to convert RTF to PDF without any fuss? Here is the solution for you. PDFelement Pro is an all-in-one PDF toolkit allowing you to edit, convert and create PDF. This program enables you to convert RTF to PDF easily. And you are also allowed to import formats like images, webpages, HTML, text files, and more for PDF creation. You can edit the created PDF as smoothly as it can be on Microsoft Office Word, besides letting you encrypt PDF files, convert them into other popular formats. Convert Office formats, RTF, Images, HTML and more to PDF. Convert PDF to Word, Excel, PowerPoint, images and more formats. Come with a wide range of powerful PDF editing tools. Easily markup, annotate and comments on PDF files. Import and extract data from PDF files or PDF forms. This free online RTF to PDF converter can easily edit, decrypt, merge or create PDF files. The popular files formats like txt, rtf, ps, xps, oxps, gif, png, jpg, tif, bmp, ppt, pps, xls, doc etc. can be converted into a PDF file here. The uppermost limit of a file size that can be converted here is 50 MB. The site can convert a variety of file types on an easy-to-use platform. The PDFs that are uploaded here are automatically unlocked for the convenience of the user. It cannot convert files that are larger than 50 MB in size. It is only supported by new browsers like the Firefox 3.6, Chrome 4, and Internet Explorer 10. Zamzar's RTF to PDF is a simple virtual platform where RTF files can be easily changed into PDF documents, you can use this tool to convert RTF to PDF online. It only supports the conversion of RTF files into PDF. The size of the file uploaded for conversion can be up to 100 MB. It is a simple interface for quick conversion of RTF files to PDF. It can also convert RTF documents to the doc, pcx, ps and png formats. It only supports file size in 100MB. The converted files are sent to you via email. Another free online RTF to PDF converter with whose help you can convert RTF to PDF online is Convert.Files. It can convert all the common file formats into a PDF and enjoys a free limit on file size. The browser has a simple user-friendly stance. It can convert a variety of other file types to PDF besides rtf files. It cannot edit PDF files. It cannot encrypt PDF files. 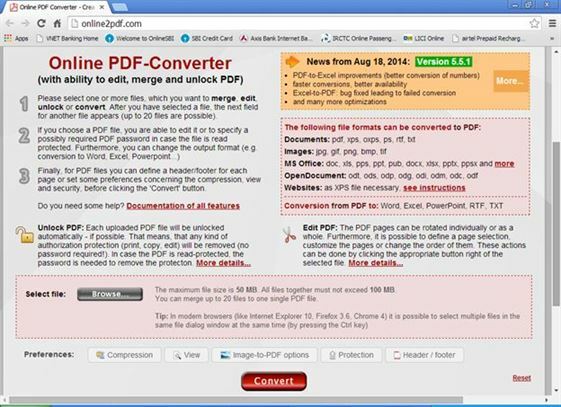 Office Converter is an online free RTF to PDF converter tool. With the help of this online tool, you can convert RTF to PDF online for free. The website supports the conversion of all the major kinds of files into PDF. For users who can convert files for free the maximum limit on file size is 10 MB. Users can also convert a variety of file types with this online service. The simple interface of the online tool lets users drag and drop files from the desktop on to the webpage for conversion. The files that are uploaded to the site get automatically deleted after one day. Files of only 10 MB or less size can only be converted here. ThePDF.com is a free online platform where files can be converted to PDFs among other PDF-related functions. 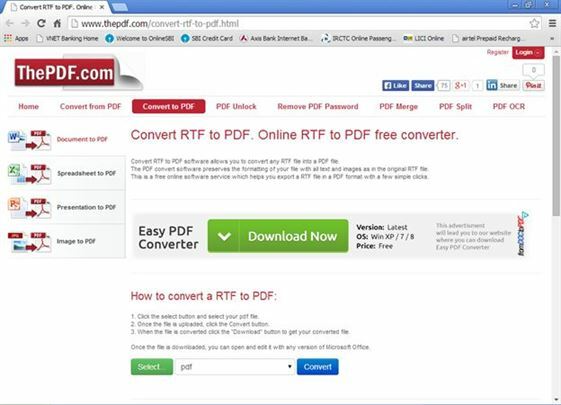 You can use this online RTF to PDF converter to free convert RTF to PDF online easily. It supports the conversion of Word, Excel, PowerPoint or Image files to PDF formats. There is no limit to the file size of the file taken for conversion. It can convert files in a smooth and fast process. It can preserve the formatting of the RTF files. It only converts a limited range of files to PDFs. You need to download the converted file separately. Doxillion Free Mac Document Converter for Mac assists users with the simple conversion tasks of popular file types to PDF. It supports the conversion of doc, docx, odt, rtf files to PDF. The software does not require any extra setup after installation. It has an easy-to-understand intuitive interface. It has some issues when it comes to spacing and alignment of converted files. It can only work with Mac OS. Office Convert Text RTF to PDF Free is a free software that Windows users can avail. It can convert popular file formats like doc, rtf, txt to the PDF type. The fast conversion speed and superior quality. Come with a simple drag-and-drop interface. It gives a limited range of options for conversion of file types. It only can work on Windows operating system. The RTF to PDF Converter is a software compatible with the Windows operating system. The tool can be used to convert RTF files and strings to the PDF format. Users can also add editorial touches to the documents. It creates easily integrated PDF files out of RTF strings and files. It can has web service and console application features. It leaves its watermark on its converted files. It only supports the Windows operating system. RTF Convertor is an effective application that converts RTF or Word documents into the PDF, Excel, images and other formats. 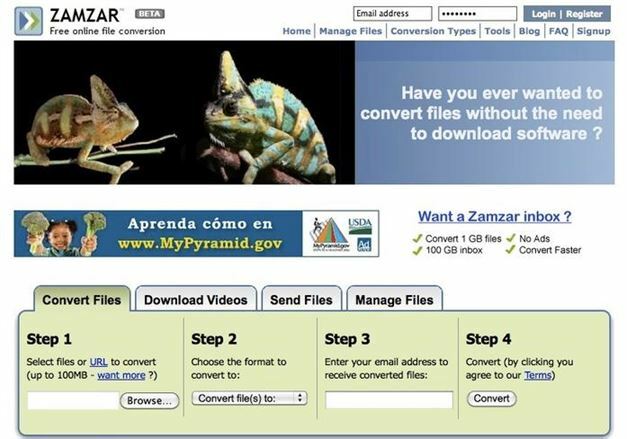 More than ten popular file types are supported for conversion. It has a simple and swift interface. It can not only convert RTF files into PDFs but also into Excel and image formats. The application has a limited functionality. It is only supported by the different versions of Windows. OX PDF's RTF to PDF Converter is specifically customized to change RTF files into the PDF format on the Windows system. 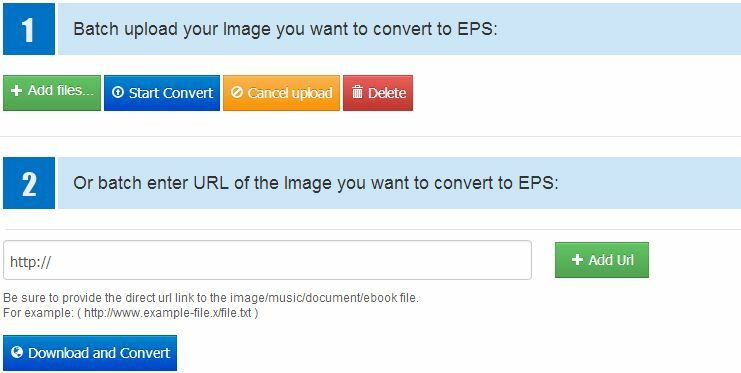 Besides converting RTFs to PDFs the application can also convert them into image and script formats. It can join more than one RTF files into a single PDF. It can encrypt PDFs with passwords. It has a limited scope of conversion with regard to file types. It is only compatible with the Windows OS. 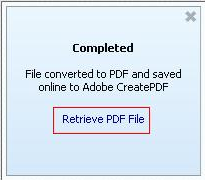 Adobe Acrobat also presents a simple way to convert RTF documents to PDF. As the premier PDF tool to choose, Adobe Acrobat is both reliable and easy to use. 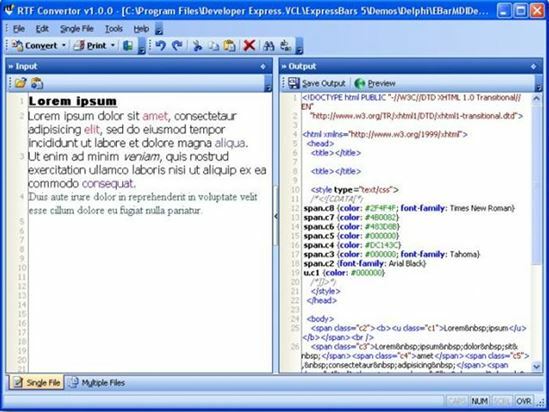 It also helps that the program has a whole host of other features to help you edit the converted PDF document. To use Adobe to convert RTF to PDF, follow these very simple steps. Step 1. Begin by downloading and installing Adobe Reader to your computer. Once the program is installed, open it. Step 2. Once it is open, click on "File" and then choose "Create PDF". Step 3. This will open a new window, allowing you to add the RTF file you want to convert to PDF. Click "Add File" and then choose the file you need to add. Step 4. Click "Convert" to begin the conversion process. You may be prompted to sign in to your Adobe account. Once signed in, the program will proceed to convert the file and then upload it online. Step 5. If you want to save the file on your computer, click on "Retrieve PDF File" in the window that will appear after the conversion is complete. Select the new PDF document and click "Download" to save it to your computer. Note: Once it saved, you can easily then use Adobe Reader or any other program to open the PDF document. To edit the PDF file though, you will need to get Adobe Acrobat Pro or any other PDF tool that can be used for that purpose.